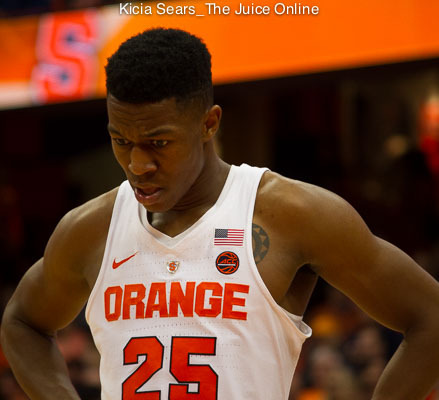 In a game with 15 ties and 20 lead changes, the final exchange of control came when Frank Howard found Tyus Battle in the left corner for a three-point bomb that propelled Syracuse to a 72-70 win over Maryland in the first game of the Big Ten-ACC Challenge. Battle’s three electrified the home crowd and gave the Orange (6-0) a 68-66 lead with just under a minute on the clock. That crucial triple game amidst of a closing stretch of nine straight points by Battle and SU needed every one to turn aside the Terrapins (6-2). Maryland did a lot of their damage from deep, piling up 11 three-pointers in the game, led by Kevin Huerter, who hit three deep triples among his seven treys in the game as he poured in a game-high 23 points. The last of Huerter’s threes sliced the Syracuse lead to a single point with 7.5 seconds to play, but the Orange struck back with a clever inbounds play. Battle and backcourt mate Frank Howard faked cross screens, then Battle streaked down the court. A long lead pass and a two-handed slam by Battle later, SU held a 72-69 lead with three seconds left. The Terps would add a free throw to their side, but when the second foul shot was intentionally missed, Oshae Brissett came up with the rebound and was fouled with 0.7 seconds on the clock. After missing the first free throw, Brissett intentionally missed the second and Huerter’s full-court heave proved harmless, as it followed the final horn. The contest was a contrast of strengths. Maryland picked apart the Syracuse zone for large parts of the game, compiling 22 assists on 23 field goals and hitting on 47.8 percent of their threes. The Orange, however, were able to force 18 turnovers in the game, including coming up with a dozen steals. SU also pounded the Terrapins inside, owning a 39-33 rebounding advantage, featuring 19 offensive rebounds, and owned a 42-20 advantage in points in the paint. As it would be throughout, the contest was tight in the opening minutes. Syracuse was the first team to go on top by more than two points when Bourama Sidibe put in a pair of second chance baskets for a 10-7 lead. Maryland came right back to take the lead again. » Related: How are Syracuse basketball alums doing in the NBA? The Orange would retake a three-point margin thanks to a 7-2 spurt a couple minutes later. Frank Howard set up Marek Dolezaj on the left side for a lay-up to tie the game at 14, then Oshae Brissett scored on a pretty finger roll to give SU a two-point lead. The Terps tied the game, but Tyus Battle dished to Howard for a left wing three and a 19-16 lead eight minutes into the action. Battle would push the lead to four points on his own three on the next Syracuse possession, but Maryland responded with their own 7-2 run to go in front once more. That lead would be short-lived, as the Orange ran up eight straight points in response. Battle pulled up in the lane to put SU back in front, then Sidibe recovered nicely from having his shot blocked by gathering the ball and scoring. Dolezaj added two free throws, then Brissett followed his own miss off a beautiful spin move for a 32-25 lead that forced a Terps’ time out with just over five minutes left in the opening half. The break righted Maryland’s ship, as they got threes to bookend their own 8-0 burst to go back in front. Syracuse would get a couple pretty passes, an alley-oop from Howard to Paschal Chukwu and a dish from Battle to Dolezaj to beat the shot clock for a lay-up, to take a 36-35 halftime lead. Maryland used a half dozen unanswered points to take a four-point lead 3:30 into the second half, but the Orange hung an 8-2 run to take the lead back. Howard started things by going the length of the court for a left-handed lay-in and added a short jumper. 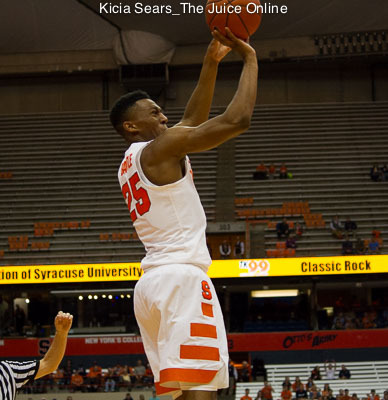 Sidibe matched a Terrapin basket with a pair of free throws, then Battle put SU on top with a soft jumper that bounced all over the rim before dropping. Maryland regained the lead, but Syracuse again took it back, this time with six straight points a couple minutes later. The Terps were unimpressed and posted seven unanswered points for a 59-56 lead with just over seven minutes left. The Orange scratched back, eventually knotting the game when Howard dished to Chukwu for a two-handed slam, then taking the lead on Brissett’s three-point play. Three minutes later, Kevin Huerter bombed in another trey to give Maryland a 66-65 lead, setting the stage for Battle’s finishing kick. 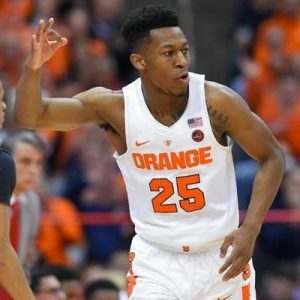 After a slow first half, Tyus Battle scored 13 of his 18 points in the second half. Despite an off shooting night, Frank Howard played an excellent game, adding seven steals to a double-double of 15 points and ten assists. Oshae Brissett almost had a double-double in the second half and finished with 15 points and 13 rebounds. Marek Dolezaj added ten points and Bourama Sidibe chipped in with eight. Maryland’s Kevin Huerter had 23 points, pacing all scorers in the game. Bruno Fernando had 13 points and Anthony Cowan had 11 to join Huerter in double figures. Darryl Morsell and Justin Jackson added nine and eight points, respectively. Syracuse is off until Saturday, when they will have their first road trip of the season when they face #2 Kansas in the Hoophall Miami Invitational in Miami, Florida. The Jayhawks (5-0) will face Toledo on Tuesday prior to their trip to the Sunshine State. KU has already hammered the other two mutual opponents in the event, routing Texas Southern and Oakland by 43 points each, as well as picking up a win over then-#5 Kentucky earlier in the season. Five different players are averaging in double figures for Kansas, including three over 16 points per game. Sviatoslav Mykhailiuk (18.8 points/game), Lagerald Vick (17.6 points/game), and Udoka Azubuike (16.8 points/game) are the headliners of that balanced Jayhawk attack. The action will get underway at 5:30pm Eastern and ESPN will televise the Syracuse-Kansas tilt. The game will also be available online at ESPN3.com.